A moderately successful author specializing in true crime books, moves to a small Pennsylvania town to investigate mysterious deaths in a family and the disappearance of their young daughter. That’s the set-up for Sinister, a horror movie that arrives in theaters bolstered by a fair number of positive early reviews. But for my money, Sinister undermines itself in ways that limit the power of its creepiness. 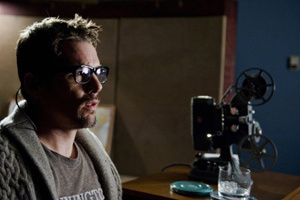 To begin with, it’s highly unlikely that an author (played here by an overworked Ethan Hawke) of crime books would bring his wife and two school-aged children on a venture that requires him to deal with a ton of grisly material or that he would knowingly move into the house where the apparent crime occurred. In the movie, he does both. Of course, that’s precisely where Sinister wants to put Hawke’s Ellison Oswalt. Why? Because as soon as Oswalt and his family move in, he finds a projector and a box full of Super-8 movies in the attic. These home movies (another addition to the ever-growing found footage genre) show a variety of gruesome murders, beginning with the hanging of four members of the family that previously occupied the house. Another movie shows a different family being bound, locked in their car with gas cans and set on fire. You get the idea: Each film provides a record of a horrific crime. Director Scott Derrickson (The Exorcism of Emily Rose) has made a haunted house movie in which you may find the ghosts of previous horror. Sinister ends on a satisfactorily creepy note — in no small part due to Christopher Young’s eerie score — but breaks little new ground either as psychologically-based horror or as a cautionary tale about the dangers of watching carnage on film. On camera constantly, Hawke does his best to create a character who says he’s after justice but who really longs for fame and fortune. Hawke’s Oswalt thinks that the footage he’s found in the attic will help him achieve his goal. He tells his wife (Juliet Rylance) that he’s stumbled onto his In Cold Blood. Movies such as Sinister require the presence of an expert on the occult. Vincent D’Onofrio portrays Sinister’s version of that character, adding one fresh wrinkle. Oswalt and D’Onofrio’s character never meet; they communicate via Skype. James Ransone deserves mention for a nicely understated turn as a slightly goofy deputy who offers to help Oswalt with his research. Let me tell you why I eventually stopped trying to suspend what was left of my crumbling disbelief. Whenever Oswalt suspects that an intruder has invaded his home during the night, he grabs a baseball bat and wanders around darkened rooms. I get it. Derrickson obviously wants to make things as scary as possible, but please. The first thing we expect any person to do when investigating a possible intruder is (you guessed it) turn on the lights. Sinister may be better made than the usual run of horror movies, and you almost can feel it trying to distinguish itself from the saw-and-gore pack. It’s not without scares, but it’s nothing to scream about, either.